22 Tips for Growing Tomatoes! 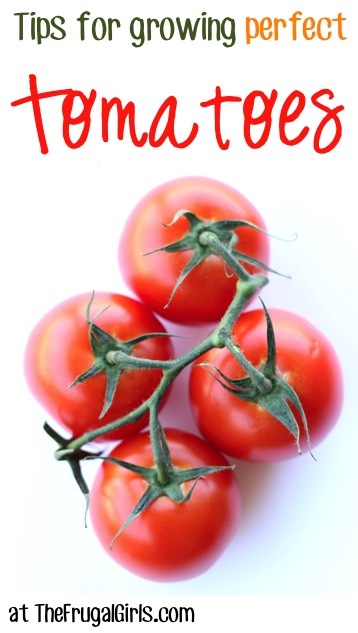 Do you want to grow some perfect tomatoes in your garden this year?? Get the scoop with these 27 Tomato Plant Tips for Growing Perfect Tomatoes! Going to use galvanized water trough. 3ft by 5 to 6 ft long 2 ft deep. Should I drill it and add gravel then the soils? I always have the problem of the tomato cracking, no matter how I water the plant! I read somewhere online that you could use a baking soda spray to spray the tomatoes and that would stop or prevent the fruit from cracking. any truth to this? Pick just before tomato ripens let sit in windowsill. Every year about the first of Feb. I cut up water oak leaves and scattered in my garden alone with chicken mature. I cut it all in. About the the first week of April, ( I live in Ms.) I place my black landscape plastic down..cut holes in it 3 feet apart set my tomatoes…and that all I do. They get from 8 to 12 feet tall depending on the variety…celebrity is my favorite. I have had to dig up all my tomato plant because of horn worms how do I get rid of them for good? BT is a dust and it is only harmful to horn worms. In my area we dust them on the 4th of July just as the worms are coming out. If you see a big moth that looks a lot like a humming bird, that’s the moth that creates the horn worm. I read an article years ago, and tried it and was SHOCKED at the result. Transplant your tomatoes as usual, then get a big sheet of black plastic, lay it down, cutting slits just big enough to pull the tomato plant through and then put the plastic back snugly around the stem. The black plastic will attract the heat, which will also bring the moisture up from the soil. You NEVER have to weed, (biggest bonus) never have to water and your yield is amazing. I tried this with 3 in the plastic, 3 without the plastic, all of the same type and I got more & bigger tomatoes from one plant with the plastic around it than I did with all 3 without the plastic. (such as almost a wheel barrow full from 1 plant compared to quite a bit less from the 3 that didn’t have the plastic around them) I told a friend about this and she has tried it and is absolutely amazed at how well it worked, loved that she didn’t have to water, weed, etc., and how much more she got. thank you so much. I tried to grow tomatos on my balcony for a years. But not very big success. Liked your advices to plant them in 5 gallon buckets. Will try now. Isnt summer in florida to hot for tomatoes? When we plant tomatoes, we put them in the ground, we cut the bottom out of a 5 gal. bucket put that over the plant, then when you water them, the water doesn,t all run off of them, and it protects the plant from grounds insects and animals, then if the cold weather hasn’t left yet, put the lid over the plant at night to protect it from frost or cold, they do really good doing this! HI, my mane is maria I try to grow my tomates in a bucket that because I lived In apatments which they do grow but very small I try different thing but so far It hasn’t been a successful I have ask people and they just laught.,I would really love to get big tomotes atleast one time. I appreaciated if you can give me some ideas please “thanks” for your time. I have great lock planting my tomatoes in 5 gal buckets. Only 1 plant per bucket. Put holes 1 inch from the bottom on the sides of the bucket for drainage. Put about one inch of large gravel in the bottom of the bucket and then fill with 1/3 black cow, potting soil and peat moss. Plant tomatoe up to first set of leaves. After 1 week, if you drink coffee, and left over coffee after it cools water your plant with that. After 1 week of coffee sprinkle epsom salts around the plant and continue to water alternating coffee and water as needed. I plant mine on my deck and they reach above the gutter every year. How much epson salt to you use per plant, in 5 gallon bucksts? Have you hear of putting ES in the hole when planting tomatoes? I am planting mine tomorrow, I live in North Louisiana. Thanks for any info and happy gardening. If you planting in a container, you should mix 1/3 potting soil, 1/3 composted cow manure (I like Black Kow brand), and 1/3 peet moss. Also, put a handful of Epson salt in the hole when you plant. I also plant marigolds about 1 foot from them. I use big containers (20 gallon) smart pots. My tomatoes were big as your hand, and my plants were 6 feet tall last year. If you plant in the ground, dig out a big hole, and put back 1/3 cow manure, and 2/3 soil, and added the Epson salt. The Epson salt keeps it from having blossom end rot. we tried these tips this year with both our pear tomato we planted in a tub (which requires MUCH more water) as well as the cherry planted in the ground… 1st of all, you want to bury the tomato itself pretty deep in the ground, so only about a 1/3 so the root ball can get big. What we did differently this year was dug the hole about 8 to 12 in deeper, put in fish heads (other parts work too), a few aspirins, crushed egg shells, and some ground bonemeal. Cover that up with a few inches of dirt and put the plant on top of it. I don’t know what each of these things exactly do, but both our tomato plants are just HUGE this year and dripping with blooms. Fish heads? I’ve heard of all the others, but that is definitely a new one. My tomatoes failed miserably last year. I don’t know if it just didn’t get warm enough or what, but I do know that I’m not the only one that had problems. Friends of ours use fish parts and rough fish (suckers/sheepshead/carp) and will bury them below the plants….biggest and best tomatoes I’ve ever seen or tasted. Tomato plants don’t like their feet wet at night. Water in the early morning if possible. This lets them drink up and stay hydrated during hot days. I didn’t know tomato plants didn’t like to be watered at night. Thanks for the tip.